DALISH CONFIRMED TO HAVE AN ACTUAL BOW FOR A STAFF. Was tagged again for this by @spirrum a while ago but have just now got to the seventh page of the next unpublished chapter, so now I have something to answer with! The rules are as follows: Go to page 7 of your WIP, go to the seventh line, share seven sentences, and tag 7 more writer-bloggers to continue the challenge. Tagging, no obligation: @broodywolf @quinnlocke @glyphron @lyriumrebel @loquaciousquark @w0rdinista @vertigosight and anyone else interested! This snippet is spoilery if you haven’t read through chapter 14 of Warriors Such As, so here follows a cut. Proceed at your own spoilable risk. Fenris considered finding out just how well recovered his markings were, but the extra guards and his lack of any other weapon, as well as the fact that they already had Metis fastened into his restraints, stopped him from any rash attempt at escape. Then Licinius, raising his staff, motioned for Fenris to be brought close. Feeling the ropes cut away from his wrists, he tensed, prepared to be returned to restraints himself, but the magister had other ideas. “We must be sure the markings are done exactly right this time,” Licinius said, beckoning Fenris closer to Metis’ table. “I want you where we can see you most easily. Right there – stop. Yes, that will do. And he began to speak of pain. Slowly at first, halting, overwhelmed himself at the memory of the torment he had long struggled to put behind him. But it became easier as he went on, the warmth of his father beside him a reminder that his purpose was to spare Metis the same panic he had felt at the first bright flare of pain from the brand on his skin, the first white wash of pain from the lyrium bonding to the burns, the mad rush of pain overwhelming his thoughts, flooding his mind and crowding out his dearest memories. Fenris grasped at Metis’ own tactics and found the strength to explain it all calmly, academically, observing from time’s distance the unspeakable trial he had gone through and finding it possible to speak of it after all. And by the end, his father’s head leaned against his shoulder; for which of them the comfort was meant, Fenris was unsure, but it was enough for them both. Bound hands prevented Metis from working any magic, but Fenris could feel the lyrium in his skin listening to the magic in his father’s blood, as if waking from the sleep induced by the magister’s potion upon them both. There’s such subtle nuance in the way Thalon tilts his head. He knows somehow without having to ask that the man before him is Inquisitor Ameridan, and he knows this man deserves his respect. 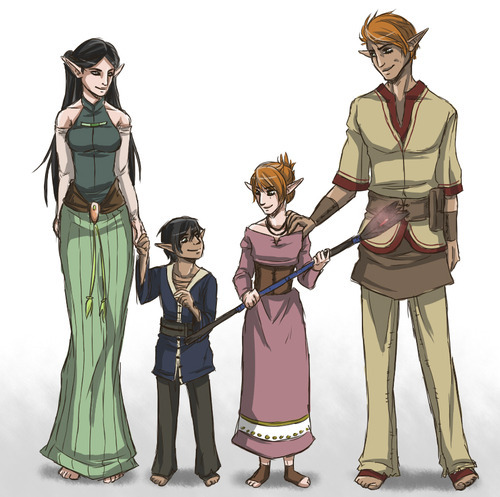 More than that, Ameridan is an elven mage, Thalon’s elder, someone he would have called hahren if they had lived in the same time. Yet even as he bows his head, Thalon maintains eye contact – they are two equals before one another. Ameridan returns his greeting with the same unquestioning respect, knowing that no matter how Thalon came to hold the title Inquisitor, he bears a weighty burden on his shoulders. He greets Thalon in Elvhen as one of the People without hesitation, as a brother, and there’s a light in his eyes that says he’s comforted to see that one of the elvhen has carried forward his legacy. Finally, there’s Solas in the background, watching Thalon, as if observing the way the Inquisitor interacts with this elf from another age. I wonder what Solas might be thinking here – about Thalon and the heritage he bears of his ancestors, about Ameridan and the lost legacy of Andraste among the elves, about the hundreds of years of elven history that he has missed during his long slumber. Three generations of elven men stand before each other – the elf of Arlathan, the elf of Halamshiral, and the elf of the Dalish clans. There’s such damn powerful symmetry in that…and gods, it makes me ache.